JOIN A COMMUNITY FOR CHANGE! Tounché Global Consciousness Summit is a day-long lifechanging soul retreat held on sacred locations around the world. A truly diverse gathering seeking to open a dialogue and offer solutions while creating an unforgettable healing experience. A new kind of leadership is called upon us to lead the necessary revolution to create a more loving and compassionate world where all can thrive: humans, animals, nature, cosmos. We are all called to be Sacred Leaders. Leaders who transcend the illusion of separation, have a humble and reverent approach to the world, who lead from a profound and serene place of alignment with All. Join an incredible lineup from all around the world for this day-long gathering followed by an embodied meditation party. Tounché Bali 2019 is taking place at KURA KURA BALI “THE HAPPINESS ISLAND”, located off the paradise island of Bali, the Island of the Gods. Steeped in the richest of cultural, artistic and historical traditions. Intact over the centuries, strengthened by the tripartite philosophy of human’s rightful place in the cosmos. The ancient philosophy of Tri Hita Karana has been teaching generation after generation of Balinese how to maintain spiritual harmony between Human, Nature and Creation. Sakenan temple on the island is one of the most sacred temples in Bali, with more than 300,000 pilgrims visiting it annually. All the below are confirmed speakers. This section is being updated regularly to add new confirmed speakers. Please send us an email at explore@shiftwithin.me with your bio if you would like to share your gifts and be considered in our lineup. Boston born Alan Clements, after dropping out of the University of Virginia in his second year, went to the East and become one of the first Westerners to ordain as a Buddhist monk in Myanmar (formerly known as Burma), where he lived at the Mahasi Sasana Yeiktha (MSY) Mindfulness Meditation Centre Yangon (formerly Rangoon) for nearly five years, training in both the practice and teaching of Satipatthana Vipassana (insight) meditation and Buddhist psychology (Abhidhamma), under the guidance of his preceptor the Venerable Mahasi Sayadaw, and his successor Sayadaw U Pandita. In 1984, forced to leave the monastery by Burma’s military authorities, with no reason given, Clements returned to the West and through invitation, lectured widely on the “wisdom of mindfulness,” in addition to leading numerous mindfulness-based meditation retreats and trainings throughout the US, Australia, and Canada. In 1988, he integrated into his classical Buddhist training a political awareness that included global human rights, environmental sanity, democracy and the preciousness of everyday freedom. His efforts working on behalf of oppressed peoples led a former director of Amnesty International to call Alan “one of the most important and compelling voices of our times.” As an investigative journalist Alan has lived in some of the most highly volatile areas of the world. In the jungles of Burma, in 1990, he was one of the first eye-witnesses to document the mass oppression of ethnic minorities by Burma’s military, which resulted in his first book, “Burma: The Next Killing Fields?” (with a foreword by the Dalai Lama). Alan is also a political and spiritual satirist, and performs his one person show “Spiritually Incorrect: In Defense of Being, Human,” to audiences around the world, as benefits to raise awareness of global human rights, Burma’s ongoing struggle for freedom, as well as to highlight the plight of political prisoners, worldwide. Clements has been interviewed on ABC’s Nightline, CBS Evening News, Talk to America, CBC, VOA, BBC, and by the New York Times, London Times, Time and Newsweek magazines, Yoga Journal, Conscious Living, Utne, and scores of other media worldwide. Amisha Ghadiali is an activist, yoga facilitator and intuitive healer. She is interested in where our inner and outer worlds meet. She hosts the globally acclaimed podcast The Future Is Beautiful which weaves together Politics, Spirituality, Creativity and Sustainability. The show offers deep, insightful, unedited conversations with fascinating and diverse guests, calling forth a challenging and open ended narrative for our expanding worlds. Amisha holds Yoga workshops and Rituals across the world, which bring together Mantra, Asana, Meditation, Mudra, Mythology, Dance, Philosophy, Activism, Energy clearing and deep dives into the psyche. She leads retreats and immersive experiences including annual pilgrimages to India (her native land) and Wild Grace: A Heroine's Journey. 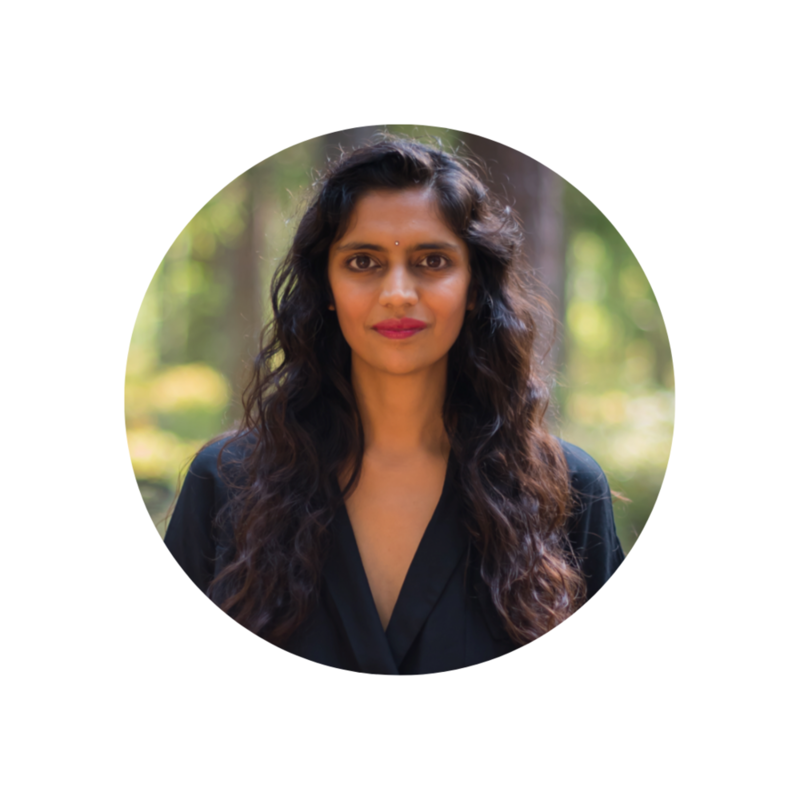 Amisha works one to one with her intuitive therapy and through her Presence Mentoring programme which supports you in clearing unconscious patterning, opening up new qualities within and anchoring daily practice and rituals which support your lifestyle. A big part of her ‘Yoga’ is exploring how we relate to the world around us and embody our values at this challenging time. Amisha's background is in Politics, Design and Sustainable Fashion. Projects include her own ethical jewellery label, Ethical Fashion Forum, Fashion Revolution, Provenance and positions in government. She created the collaborative book, The Future Is Beautiful - A Collection from Think Act Vote, coining the term Creative Activism and bringing together ideas and artwork from over two hundred contributors to inspire a brighter future. Amisha is currently writing a new book called Style & Presence which brings together a decade of research (and a lifetime of personal experience) exploring our relationship with self-worth, the worth of the world and how these two things are connected. Emilia Lahti (MSc, MAPP) is an international presenter on topics of courage, compassion and excellence in leadership. In her Ph.D. she is pioneering the research on the Finnish construct of sisu, which denotes deep embodied fortitude in the face of adversity. Emilia has a master's degree in social psychology and a master’s in applied positive psychology from the University of Pennsylvania. Her work has been featured by The New Yorker, BBC, Scientific American and Forbes among others. She has delivered speeches at Fortune500 companies, as well as at Stanford University, TEDx, and Singularity University at NASA Ames, where she also studied futurism and exponential technologies. She is the founder of a non-profit called Sisu Not Silence that aims to promote action and research on nonviolence and active compassion in all domains of our lives. She is an outspoken activist for peace and social responsibility, and a curious explorer of ideas that help elevate our collective consciousness. In 2018, Emilia completed a 2400 km/50-day long solo ultra run across the length of New Zealand to launch Sisu Not Silence and celebrate the strength of overcomers of interpersonal violence. In 2018, she was a Ten Outstanding Young Persons of the World award finalist by the Junior Chamber of Commerce for her work in human rights and peace activism. Her personal life mission involves being an active catalyst for human connection and compassion. Being a passionate systems thinker, Emilia sees that we are all part of a larger collective entity through the social networks we belong to. In creating cultures which enable individuals to thrive, it is imperative to create social awareness of the significance each person has on the possible future of society, and of how sensitive the broader dynamic system is to each of our individual actions (both positive and negative). Emilia believes is our sacred collective call to create socially warm, inviting spaces that enable people to reach their truest high expression. As a world-traveler native to Bali, Made Janur Yasa embodies Eastern philosophy blended with Western lifestyle. Certified in Somatic Coaching and leadership training from the Strozzi Institute in California, his long-studied practice of Aikido has remained the physical metaphor underpinning his studies and his teaching. He has found that the tenets of his Balinese cultural heritage have likewise reinforced his interest in and comprehension of Somatic, as both share a similar wisdom that views body and mind as inseparable rather than a duality. Janur has coached youth, university students, individuals, couples and corporate teams in somatic/leadership skills all over the world and is proud to have established the Dojo or “place of awakening” at Moksa restaurant, to bring these and other life-transforming practices to both the Balinese and ex-pat communities of Ubud. Moksa plant-based restaurant and permaculture garden, his co-creation with executive chef, Madé Runatha, has likewise enabled Janur to pursue his passion for environment, sustainability, and the way food fits inherently into the equation of individual healing, community consciousness, and holistic awareness. The restaurant’s titular name itself stands as a beacon for which to aim: the path of mastery to reach one’s highest self through practice, dedication and awareness. To Jane Chen, every day is a learning day - how she lives it and learns from it influences her work and creation. She believes that through guidance, inspiration and education; the people who she worked with will be able to make positive changes in their lives. Jane finds time to pursue many Indonesian cultural activities. For the past 30 yrs she has been cultivating her “ White Crane” Silat practice, an ancient Indonesia Martial Arts from Southern China Shaolin that promotes a sound mind and a fit physical body into her creation. She is also involved in body movements and the artistic aspects of martial arts and breathing meditation, choreographing and recording rare traditional seldom performed meditative dance movements. All of these activities are part of her rich and diverse Indonesian heritage, which she would like to record and pass down for posterity. For Jane, working is like playing and she flows constantly through/along with the ‘callings’ of her heart & soul. These days, her work is the accumulations of all her experiences be it, fashion design, pottery, product designs, sound and scent blending, vocal, martial art, meditation and vipassana in motion. Jesse is an experienced entrepreneur, keynote speaker, and technologist, driving innovation by empowering people, companies and societies to change for good. He believes in the power of people to rethink, rewrite, and reshape the future by understanding the world’s fundamental shifts and using technology to take bold action for lasting transformational change. As a dynamic speaker, Jesse brings practical experience and hard learned lessons, combined with a unique ability to inspire people and cultivate transformation. Jesse believes that fast pace of technological change will bring further inequality and hopes that he and his companies can inspire the next generation of innovators to help people better manage and work with machines to create a world with greater equality and better access to resources. Jesse is the Managing Director of The Robot Of The Year, in Asia, the first international prize that rewards the best innovations in artificial intelligence and robotics. He is also the founder of JohnnyFive AI Limited, and the commercial director of AIHealth, where he works closely with universities and governments to develop sustainable ecosystems for AI technologies that enable improvements in social welfare and healthcare. Being passionate about the democratization of AI and robotics, Jesse believes that large tech companies need to be more responsible for the ethical development of these technologies. Through his speaking engagements and his foundation AIforgood.asia, Jesse is an advocate for change and believes that we all can take a leadership role in the ethical and responsible development of AI and robotics for the benefit of everyone. Originally from San Francisco, California, now residing in Bali, Indonesia, Kamau Abayomi has lived, performed and taught internationally as a multi-disciplinary artistic mystic for last 20 years. He is 2-time international poetry slam champion, award winning choreographer, an author, recording artist, dj, youth mentor and spiritual guide. Under his Live Mysteries presentations, Kamau has curated over 50 original events internationally. Kamau is also a certified White Tiger Qi Gong instructor and co-founder of the Integral Grounding, a practical system of integrating spirituality into daily life. Kamau’s artistic works and workshop sessions are rooted in ‘The Law of One’ principles and offered with the intention of inspiring others into a holistically balanced life, with the awareness, activation and expansion of their own awareness, spiritual and artistic power. Song writer, musician, sound healer and vocal coach. Layeena was part of a Moroccan band ‘Thundersouls’ from 2010-2017. They played internationally across Morocco, China, The Philippines, India, and Bali. She is a multicultural artist; her music is a fusion of different rhythms and chants inspired by her Berber, Arabic and African roots. She is now on a solo journey recording her first album utilizing her voice to share a message for peace, unity and love across humanity and planet earth. Layeena is on a path to bring light into the music world. Marcia is a Talent Development executive, a professional trainer and facilitator who helps organizations and individuals connect the dots to uncover their blind spots and accelerate the unfolding of their potential. Marcia has spend most of her professional career in big corporate, using her passion for people and strong belief in the power of inclusiveness to affect the environments she works in. She has lead award winning initiatives to drive inclusiveness and engagement in Fortune 500 companies while delivering on cross-functional business objectives. She has also supported many individuals on their personal and spiritual journeys, with her unique approach blending modern and traditional tools, western and African philosophy, compassionate and no-non sense feedback. And although she is a lover of change, she has deep respect for ancestral wisdom and their healing powers. Marcia is a continuous learner who is blessed to be surrounded by amazing teachers, her masters being her three very expressive children. As a trained Psychosomatic Therapist Melanie left the corporate world in 2012 to follow her vision of educating driven individuals about the importance of Emotional Intelligence and Chakra Philosophy, while creating her own online business and freedom lifestyle. She has a unique combination and very holistic approach to business, as she highlights how connected you are to your decision making and business strategies via your chakra system. She believes that creativity and innovation are of upmost importance as technology advancements drive us into a new way of living and operating. The Future of Work is changing. In a world full of chaos, demands, addiction, dis-ease and technology advancements, it has never been more important to be connected to who you are and how you feel. Melanie is continually approached by individuals, business owners and entrepreneurs who are worn out or disillusioned, and looking for a more meaningful connection to the next chapter of their business growth or career path. She has written a workbook, runs a number of online courses and mentors clients one:one. She also tours internationally with her Business Chakra Workshops - a recent highlight was delivering her wisdom to top executives and entrepreneurs from the home of Mahatma Gandhi in Johannesburg, South Africa. An avid lover of fresh coconuts and globe trotting, her creativity will blow your mind as she helps propel your vision into reality and stand out from the crowd in an ever changing world, where innovation and creativity are fast becoming your biggest assets. Melvin Hart is a shamanic medicine practitioner and healer who has had the opportunity to work with hundreds of people from around the world and help in their healing and integration process. He is also a Neuromuscular Therapist, LMT, and CPT, but those letters only are part of who he is, he bridges the gap between science and spirituality to create a true holistic healing catalyst for his clients. A spiritual nomad Melvin travels around the globe studying and accumulating different tools to bring his own unique perspective on consciousness development, shamanism, neo-shamanism and integration to the people. As part of his training in the world of plant medicine Melvin has worked with various indigenous shaman, done numerous dietas in the jungles and mountains of Peru- held, facilitated, and participated in 100+ plant medicine ceremonies, and continues to work with his shamanic coaching clients to integrate their experiences into their everyday lives and offer his intuitive coaching. That still is only part of his work. He is dedicated to helping people reach and activate their innate potential and bring them to the apex of their being: mentally, spiritually, and physically. Through support, accountability, and directed intention he believes all potentials can be reached and all blockages can be cleared. He continues on the lineage of his ancestors. Entrepreneur, author, activist and philanthropist Russell Simmons has launched scores of groundbreaking careers and innovative enterprises in arenas as varied as music, film, television, fashion, comedy, poetry, digital platforms, theater and finance. His lifelong mission has been giving a voice to extraordinary talent and empowering underserved communities as they in turn shape the mainstream of culture. After having produced or managed artists such as Kurtis Blow, Run DMC, Whodini and Jimmy Spicer, Simmons joined forces with producer Rick Rubin to found Def Jam Recordings. Under Simmons’ leadership as Chairman, Def Jam signed acts including the Beastie Boys, Public Enemy, LL Cool J, Jay Z and Kanye West. Simmons’ long-running HBO series “Def Comedy Jam” helped make household names of comics including Jamie Foxx, Chris Tucker, Martin Lawrence, Bernie Mac, Dave Chappelle, Kevin Hart and JB Smoove. “Def Poetry Jam,” also on HBO, won a Peabody Award and a Broadway version netted Simmons a Tony®. Simmons’ numerous big-screen hits include The Nutty Professor, which grossed more than $273 million. Simmons has written three New York Times best-selling books, including Success Through Stillness: Meditation Made Simple, which was published in 2014. He has also launched a multitude of diverse business ventures including pop-culture website Global Grind, UniRush Financial Services, Simmons Jewelry, Run Athletics and clothing subsidiaries Phat Farm, Baby Phat, Argyleculture and American Calssics. Most recently, he has been building All Def Digital, a premium, multi-platform digital media company and entertainment hub, curating, developing and connecting a new generation of content creators to global fans. Also, in the fall of 2016, Simmons opened the Tantris Center for Yogic Science in West Hollywood, CA. Tantris is a yoga lifestyle brand weaving together ancient practice, modern style, and innovative technology. The center offers hot yoga practice, workshops, teacher training, events, and an Aveda concept salon for hair and beauty. A longtime champion of social justice and equality, Simmons was honored with the 2011 GLAAD Excellence in Media Award. He is also a leading animal rights activist, having been named PETA Man of the Year in 2011. His charitable endeavors include the Diamond Empowerment Fund, a global organization that supports educational initiatives for disadvantaged people in diamond-producing African nations, Rush Philanthropic Arts Foundation, which gives young people opportunities to create and appreciate art, and Foundation for Ethnic Understanding which he serves as chairman promoting understanding and cooperation between and among ethnic groups to help reduce the existing tensions among diverse racial and ethnic communities. A native of Queens, NY, Simmons has two daughters, Ming Lee and Aoki Lee. Ageless embodied spirit to the Amazon forest realm of Suriname as the soul identity of Luciano J. H. Kross. Native ancestral bloodline descendant of West African Ashanti Iburu, Kush and Khem, Native American Wisdom keepers, Indo-European Wanderers, Mystics of Bharata & Sundaland. Much which cannot be spoken in the language of mortal man, yet can be touched upon by holy chant, poetry, sacred dance and the living omnipotent geometry of nature's divine presence when word has become silence, identity has faded away and eye has become single. I inspire as a living guide to achieve progressive integration and embodiment of our multi dimensional identity to catalyze transformation towards better health, self knowledge and liberation (moksha). To serve humanity in aiding new levels of embodied awareness, bliss and health. Silfath Pinto has spent the last 10 years supporting men and women in stepping into their brilliance and becoming happiness alchemists. She creates transformational experiences through her LuminEssence methodology, an unique fusion of Energy Medicine, Movement Therapy and Cellular Reprograming, which fosters deep shifts at a cellular level, clearing wounds, patterns and beliefs that are preventing us from living to the fullest of our potential. Silfath offerings focus on 4 main areas: somatic intelligence (healing the body), sacred relationships, life purpose/divine mission and feminine awakening. Her clients have experience beautiful paradigm shifts: from changing jobs to starting a new career, from letting go of past hurt to moving to a new city, from meeting their soulmate to improving relationships, from losing weight to flourishing in radical self-love. They call Silfath an energy shifter, a medicine woman, an adorable giggler and magic maker. In her passionate quest to empower men and women to create uplifting and lasting changes, Silfath is constantly researching and growing in the fields of Energy Alchemy, Quantum Physics and Epigenetics. She has trained in various transformative modalities including Yin Yoga, Movement Therapy, Tibetan Bowl Sound Healing, NLP, Theta Healing® and Reiki. Simon Jongenotter is a chef, Earth tender, healing facilitator and inspirational speaker on a mission to connect and empower people through their relationship to themselves, each other, the planet and his big passion: food. He travelled and lived in various countries for the past 20 years, exploring existence by moving out of his comfort zone into hectic restaurant kitchens, remote jungles, busy cities and a 5 year stint at a silent retreat center in rural Bali. He found a home, inside himself, through meditation, breathwork and energy healing. Driven by a deep love for all living beings, and a raging grief around the way we, as humans, treat our precious Mother Earth, Simon dedicates his life to facilitating growth and healing. He’s convinced that we can create a paradise for all living beings, if only we find our way back home to the sacred ways of Mother Nature. He travels regularly to share workshops, Earth circles and healing sessions. Besides that he consults for restaurant kitchens around the world. Swaady Martin is the founder of TOUNCHE. She is a serial entrepreneur, published author and former corporate executive at GE, where for 10 years she had various roles across the world. She was part of the pioneering Africa Dream Team and drove the expansion of GE’s portfolio of businesses across Africa by developing the 1st Africa Growth Playbooks for all GE businesses. In her last role at GE, she was the acting-CEO for GE South Africa Technologies and Director for GE Transportation for Sub- Saharan Africa. In 2012, she followed her entrepreneurial aspirations and created one of Africa’s most admired brands, YSWARA, a socially-conscious gourmet tea company contributing to the reversal of the African commodity trap and promoting Africa’s rich culture. YSWARA has received numerous awards and recognitions for its excellence and was the first African food brand to be retailed at the prestigious Selfridges and Harrods. In 2017, Swaady launched SHIFT WITHIN, a platform offering online & offline personal development courses and events to promote Africa’s inner revolution, including the annual Tounché Global Consciousness Summit. To date, more than 600 people have had transformative life experiences through SHIFT WITHIN programs and events. Profiled extensively in the media, from Forbes to CNN, BBC and Monocle, Swaady has made several magazine covers, received numerous awards including named to the Forbes and O Power Lists for Africa. She is a sought-after inspirational speaker, African fashion icon (Named GLAMOUR magazine Most GLAMOURous 2016) and a published author of spiritual tales for children. An explorer and lover of all things emotional and human, Tasha Zigerelli is seeking to understand the wisdom of life from all dimensions. Raised in Santa Cruz California, she has been living and working internationally for the last 6 years. An herbalist, women's health advocate, birth doula, a student of midwifery and is now exploring the realms death and grief work with her beloved herbal tea company. After losing her mother in 2014 Tasha has been dedicated to using the power of plant medicine in the form of herbal tea to help facilitate and create meaningful conversations, music, and poetry about love, life, and loss. She is on the way to receiving her education in psychotherapy and hopes to work with underrepresented women around the world in maternal mental health and bereavement. Tounché is aN INCLUSIVE conscious gathering committed to represent the diversity of the world. WE ARE HUGELY GRATEFUL TO ALL THE BEAUTIFUL SOULS & ORGANIZATIONS WHO ARE HELPING AND SUPPORTING THIS EVENT. BLESS YOU.